Thank you for your service! God Bless your family! Rest in peace, Officer Tudor. You deserve your divine reward. RIP Brother. Your service and sacrifice will never be forgotten. Rest in Peace Officer Tuder. Thank you for your service. My thoughts and Prayers go out to your family, coworkers and friends. Rest in peacce my brother in blue. 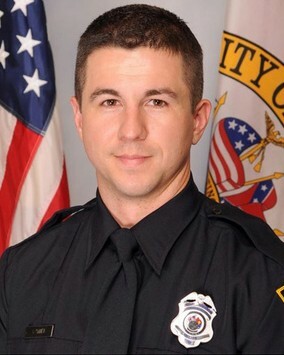 Our Prayers and Thoughts are with Officers Sean Tuders Family and Mobile Police Department. It’s been 11 months since this department lost Office Justin Bella. May God Lay His Hands Over All My Bothers and Sisters in Blue.. So extremely heart beaking to lose yet another brother or sister in blue! My/our condolences to your department and family... rest peacefully in heaven guy. Sir, I pray that God places his loving arms around your family and fellow officers giving each you comfort, peace and understanding during this time. May the Lord comfort your family, friends and co workers at this most difficult time. Go in peace blue brother your efforts are not going to forget..
Rest in Peace my brother. Prayers to your family. We just laid one of our own to rest on Saturday. Three Mobile Police officers made the long drive to Shreveport for the service. It’s moving to see such dedication for a fellow officer. I was born and raised in Mobile so this one hits close to home too. Our prayers are with his entire family and his entire blue family. Our family is now their family. Rest in peace young brother, we'll take it from here. Thank you for your service, you will not be forgotten. God bless the family, friends, and co-workers of Officer Tudor during this time of tragic and senseless loss.